2019 Bubba Wallace #43 World Wide Technology / Chevrolet Camaro ZL1 NASCAR 1/24 diecast, by Action Lionel. The Richard Petty Motorsports #43 World Wide Technology Chevrolet Camaro ZL1 will be raced by Bubba Wallace in multiple events during the 2019 Monster Energy NASCAR Cup season. 2019 Bubba Wallace #43 World Wide Technology / Chevrolet Camaro ZL1 NASCAR 1/64 diecast, by Action Lionel. The Richard Petty Motorsports #43 World Wide Technology Chevrolet Camaro ZL1 will be raced by Bubba Wallace in multiple events during the 2019 Monster Energy NASCAR Cup season. This diecast car will not have the Monster Energy decal on the windshield. 2019 Bubba Wallace #43 Transportation Impact / Chevrolet Camaro ZL1 NASCAR 1/24 diecast, by Action Lionel. 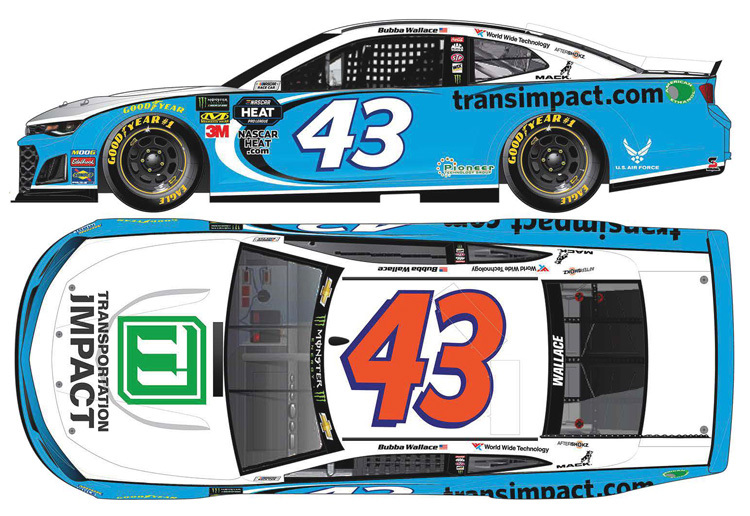 The Richard Petty Motorsports #43 Transportation Impact Chevrolet Camaro ZL1 was raced by Bubba Wallace in the Monster Energy NASCAR Cup, Pennzoil 400 by Jiffy Lube at Las Vegas Motor Speedway on March 3, 2019. 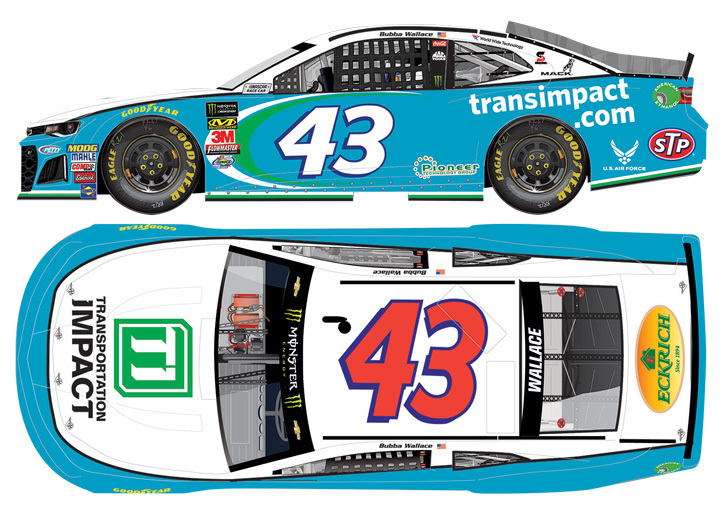 2019 Bubba Wallace #43 Transportation Impact / Chevrolet Camaro ZL1 NASCAR 1/64 diecast, by Action Lionel. 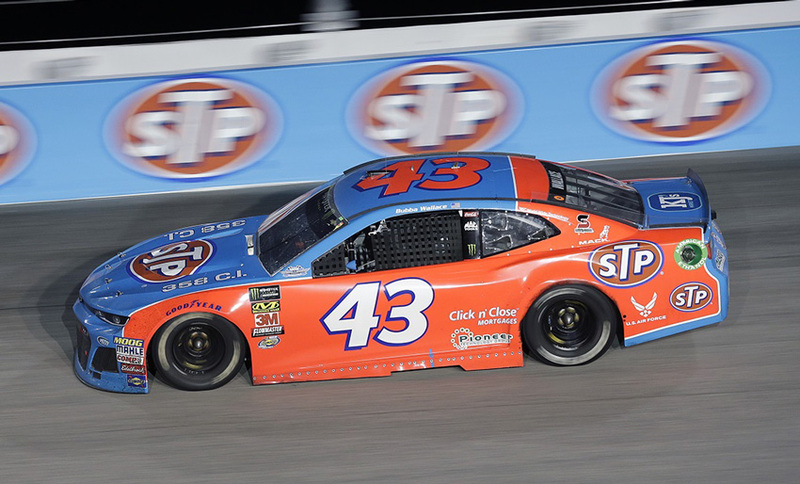 The Richard Petty Motorsports #43 Transportation Impact Chevrolet Camaro ZL1 was raced by Bubba Wallace in the Monster Energy NASCAR Cup, Pennzoil 400 by Jiffy Lube at Las Vegas Motor Speedway on March 3, 2019. This diecast car will not have the Monster Energy decal on the windshield. 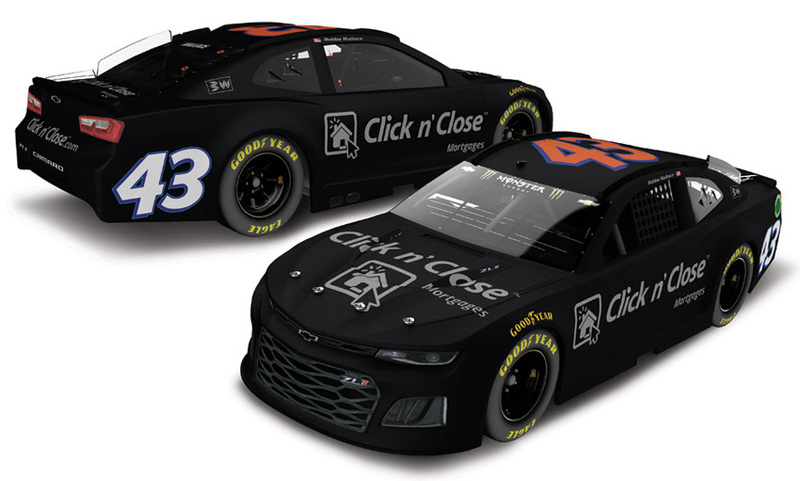 2019 Bubba Wallace #43 AfterShokz / Chevrolet Camaro ZL1 NASCAR 1/24 diecast, by Action Lionel. 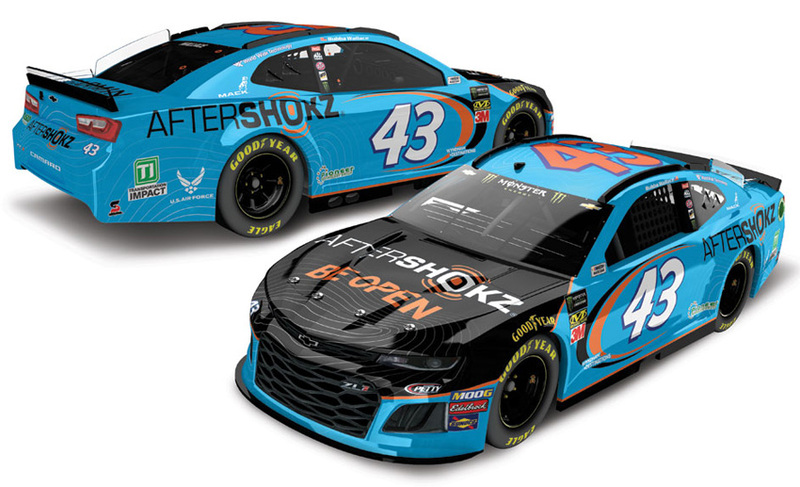 The Richard Petty Motorsports #43 AfterShokz Chevrolet Camaro ZL1 was raced by Bubba Wallace in the Monster Energy NASCAR Cup, Daytona 500 at Daytona International Speedway on February 17, 2019. Autographed version available $89.99 - Autographed by Bubba Wallace. 2019 Bubba Wallace #43 AfterShokz / Chevrolet Camaro ZL1 NASCAR 1/64 diecast, by Action Lionel. 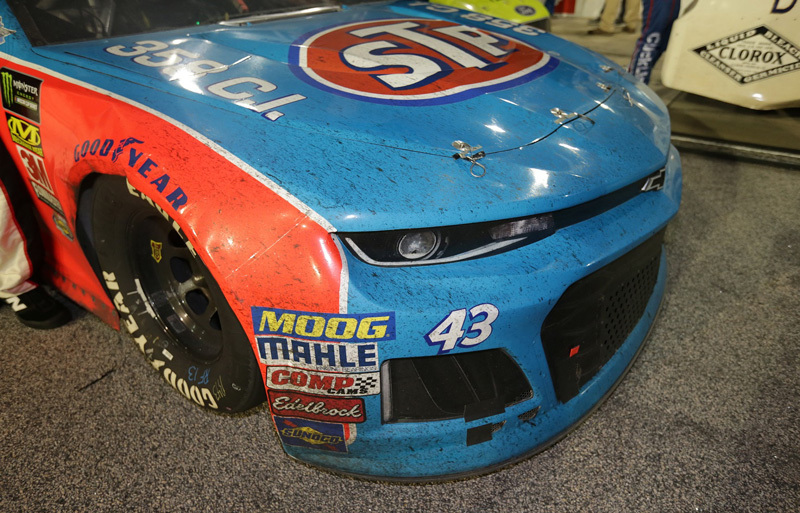 The Richard Petty Motorsports #43 AfterShokz Chevrolet Camaro ZL1 was raced by Bubba Wallace in the Monster Energy NASCAR Cup, Daytona 500 at Daytona International Speedway on February 17, 2019. This diecast car will not have the Monster Energy decal on the windshield. 2019 Bubba Wallace #43 McDonald's Team Bacon / Chevrolet Camaro ZL1 NASCAR 1/24 diecast, by Action Lionel. 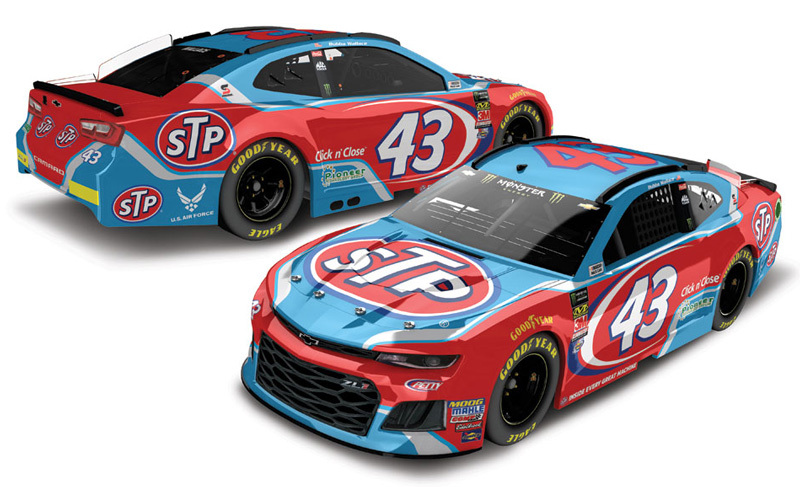 The Richard Petty Motorsports #43 McDonald's Team Bacon Chevrolet Camaro ZL1 was raced by Bubba Wallace in the Monster Energy NASCAR Cup, Folds of Honor QuickTrip 500 at Atlanta Motor Speedway on February 24, 2019. 2019 Bubba Wallace #43 McDonald's Team Bacon / Chevrolet Camaro ZL1 NASCAR 1/64 diecast, by Action Lionel. The Richard Petty Motorsports #43 McDonald's Team Bacon Chevrolet Camaro ZL1 was raced by Bubba Wallace in the Monster Energy NASCAR Cup, Folds of Honor QuickTrip 500 at Atlanta Motor Speedway on February 24, 2019. This diecast car will not have the Monster Energy decal on the windshield. 2019 Bubba Wallace #43 Plan B Sales / Chevrolet Camaro ZL1 NASCAR 1/24 diecast, by Action Lionel. The Richard Petty Motorsports #43 Plan B Sales Chevrolet Camaro ZL1 was raced by Bubba Wallace in the Monster Energy NASCAR Cup, Auto Club 400 at Auto Club Speedway (California) on March 17, 2019. 2019 Bubba Wallace #43 Plan B Sales / Chevrolet Camaro ZL1 NASCAR 1/64 diecast, by Action Lionel. The Richard Petty Motorsports #43 Plan B Sales Chevrolet Camaro ZL1 was raced by Bubba Wallace in the Monster Energy NASCAR Cup, Auto Club 400 at Auto Club Speedway (California) on March 17, 2019. This diecast car will not have the Monster Energy decal on the windshield. This paint scheme qualified for the event, but was changed overnight and not raced in the Southern 500. Autographed version available $89.99 (1 of 84) - Autographed by Bubba Wallace, on the windshield in Silver. Includes an Action Racing Collectables certificate of authenticity. 2018 Bubba Wallace #43 Pioneer Records Management / Chevrolet Camaro ZL1 NASCAR 1/24 diecast, by Action Lionel. The Richard Petty Motorsports #43 Pioneer Records Management Chevrolet Camaro ZL1 was raced by Bubba Wallace in the Monster Energy NASCAR Cup, First Data 500 at Martinsville Speedway at Kansas Speedway on October 28, 2018. 2018 Bubba Wallace #43 Pioneer Records Management / Chevrolet Camaro ZL1 NASCAR 1/64 diecast, by Action Lionel. 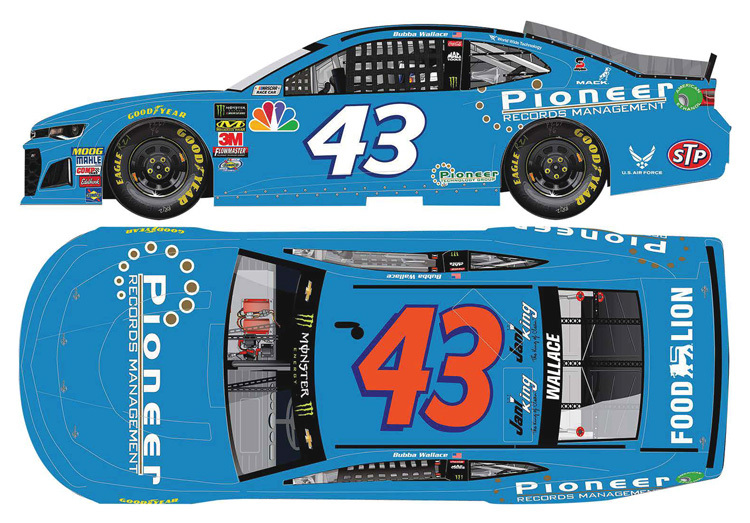 The Richard Petty Motorsports #43 Pioneer Records Management Chevrolet Camaro ZL1 was raced by Bubba Wallace in the Monster Energy NASCAR Cup, First Data 500 at Martinsville Speedway at Kansas Speedway on October 28, 2018. This diecast car will not have the Monster Energy decal on the windshield. 2018 Bubba Wallace #43 Transportation Impact / Chevrolet Camaro ZL1 NASCAR 1/24 diecast, by Action Lionel. 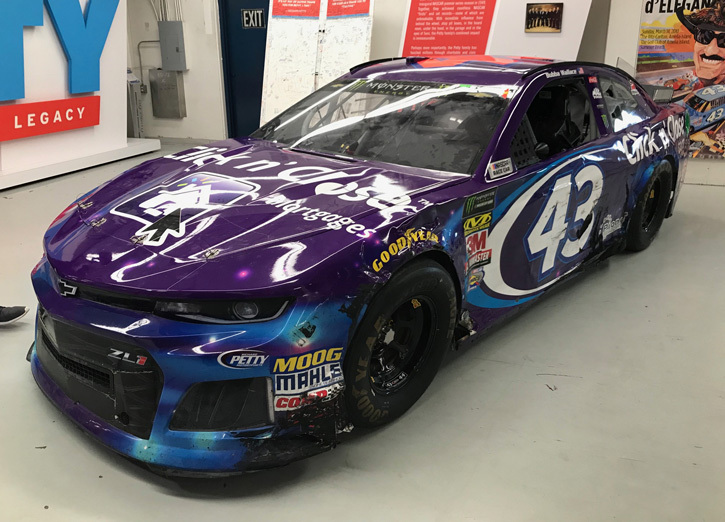 The Richard Petty Motorsports #43 Transportation Impact Chevrolet Camaro ZL1 was raced by Bubba Wallace in the Monster Energy NASCAR Cup, Hollywood Casino 400 at Kansas Speedway on October 21, 2018. 2018 Bubba Wallace #43 Transportation Impact / Chevrolet Camaro ZL1 NASCAR 1/64 diecast, by Action Lionel. 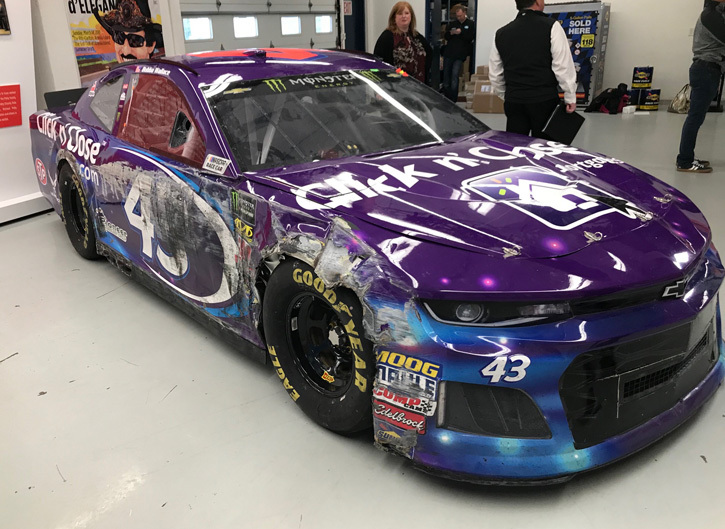 The Richard Petty Motorsports #43 Transportation Impact Chevrolet Camaro ZL1 was raced by Bubba Wallace in the Monster Energy NASCAR Cup, Hollywood Casino 400 at Kansas Speedway on October 21, 2018. This diecast car will not have the Monster Energy decal on the windshield. 2018 Bubba Wallace #43 Click n' Close / Daytona 500 / Raced Version / Chevrolet Camaro ZL1 NASCAR diecast, by Action Lionel. The Richard Petty Motorsports #43 Click n' Close Chevrolet Camaro ZL1 was raced to a 2nd-place finish by Bubba Wallace in the Monster Energy NASCAR Cup, Daytona 500 at Daytona International Speedway on February 18, 2018. 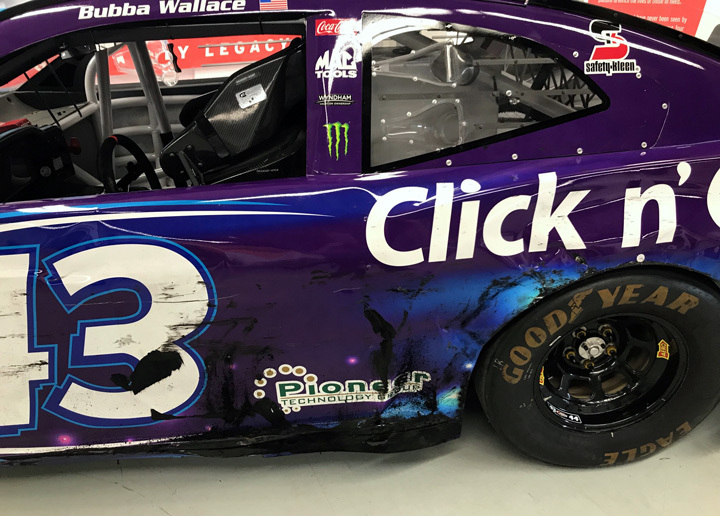 Bubba Wallace made history as he became the highest-finishing African-American driver to ever race in the Daytona 500. This diecast car will not have the Monster Energy decal on the windshield. 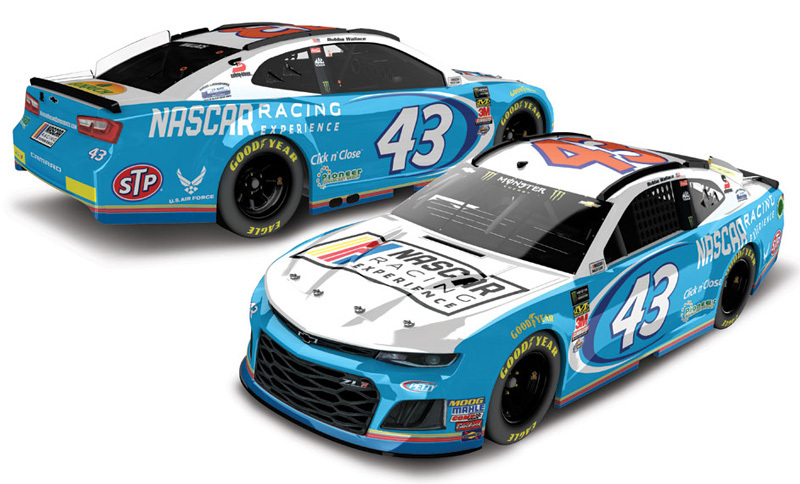 2018 Bubba Wallace #43 U.S. Air Force / Chevrolet Camaro ZL1 NASCAR diecast, by Action. The Richard Petty Motorsports #43 U.S. Air Force Chevrolet Camaro ZL1 was raced by Bubba Wallace in the Monster Energy NASCAR Cup race at Daytona International Speedway on 7/7 and ISM Raceway (Phoenix) on 11/11/2018. This diecast car will not have the Monster Energy decal on the windshield. 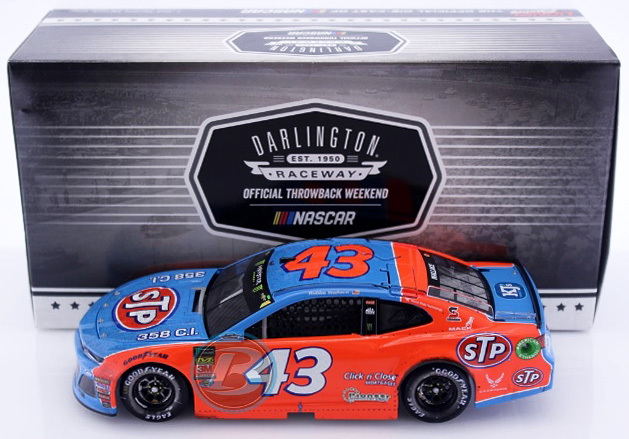 2018 Bubba Wallace #43 NASCAR Racing Experience / Chevrolet Camaro ZL1 NASCAR diecast, by Action Lionel. The Richard Petty Motorsports #43 NASCAR Racing Experience Chevrolet Camaro ZL1 was raced by Bubba Wallace in the Monster Energy NASCAR Cup, Folds of Honor QuickTrip 500 at Atlanta Motor Speedway on February 25, 2018. This diecast car will not have the Monster Energy decal on the windshield.